Publishing house «Food Industry» - Congratulations of "Food Industry" Chief Editor O.P. Presnyakova with the 20th Anniversary of Magazine "Storage and Processing of Farm Products"
Congratulations of "Food Industry" Chief Editor O.P. Presnyakova with the 20th Anniversary of Magazine "Storage and Processing of Farm Products"
Magazine "Storage and Processing of Farm Products" had its origin in 1993 – a period active economic reforms in our country. In those difficult years under the auspices of the Department of "Storage and Processing of Farm Products" of RAAS it was called to be an effective advocate for science in the field of agriculture, a unifying factor in conditions of create disunity. Gradually, the magazine has become one of the most important scientific issues for agribusiness industries in Russia. For two decades, the magazine "Storage and Processing of Farm Products" highlights and promotes new technologies not previously offered to use environmentally friendly raw materials, technical and functional foods, deals with the problems of safety and quality. Significant role in the organization of the journal work belongs to the editorial board, which is composed of prominent scientists: director of leading research institutes, doctors of sciences, professors, corresponding members, academicians of RAAS. 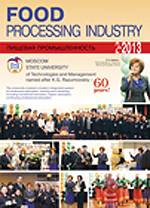 Working in close collaboration with the "Storage and Processing of Farm Products" RAAS, in category "News", magazine reflects the most important events of Department institutions scientific life, as well as meetings and conferences held in the Ministry of Agriculture of the Russian Federation, the State Duma, universities, exhibitions. The journal actively publishes famous scientists and specialists – academicians, corresponding members not only Russian, but also international academies, doctors and candidates of sciences, as well as young scientists – graduate students and even students. Due to the high scientific level and relevance of publications, magazine became authoritative and popular edition not only in Russia but also abroad. Congratulations on 20 years anniversary to our authors, readers, members of the Editorial Board. We wish you all happiness, prosperity, further creative success and fruitful cooperation for many years! Read us! Write to us! General Director, Chief Editor of the Publishing House "Food Industry"